UPFA coalition member party – Jathika Hela Urumaya (JHU) and government Minister Champika Ranawakahas said he is ashamed and angered about the present state of affairs in the country and of the multiple chances that were missed by the Rajapaksa regime to change the country’s governance system for the better. In an interview with the local mainstream Sinhala newspaper, Lankadeepa Ranawaka has pledged they have embarked on a journey to stand up and respond to those who deceived the masses, pointing out that despite the momentous people’s mandate which this government received, the Rajapaksa regime has failed to take concrete steps to do what is best for the country and its people. He has gone on to state the government has failed to translate their election triumphs into a political victory. 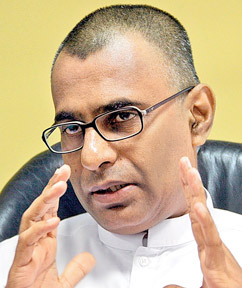 “The UNP, despite losing the election appears to have won because those who were supporting the government have shifted their support sensing the erosion – the government has lost the support of social groups, entrepreneurs and businessmen who were earlier backing them,” Ranawaka has stated.